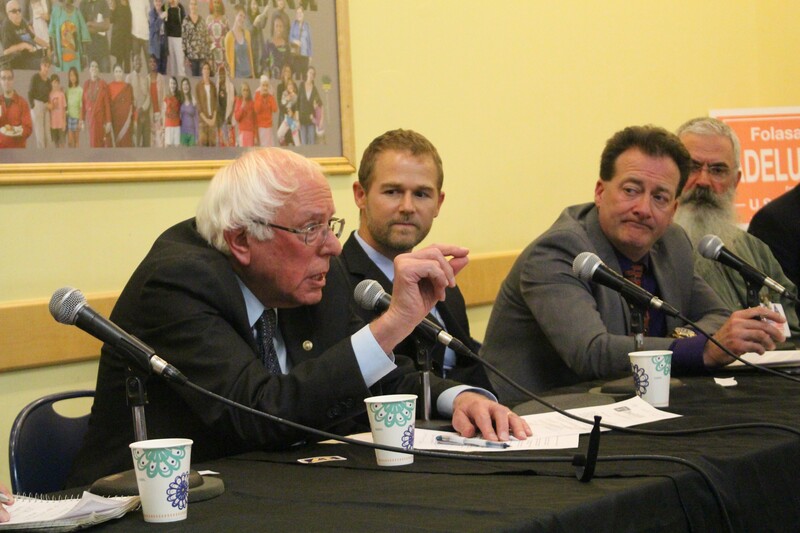 During a U.S. Senate candidate forum Monday night in Winooski, incumbent Sen. Bernie Sanders (I-Vt.) would not commit to serving a full six-year term if reelected. During Sanders’ first term in the Senate, he was present for 98 percent of roll call votes. His record faded after his reelection in 2012, largely because he ran for president in 2016. That year, when Sanders lost the Democratic primary to Hillary Clinton, he missed 115 of 163 roll call votes in the Senate. On Monday, during the debate hosted by Channel 17 and moderated by Seven Days' political editor Paul Heintz, Sanders would not pledge to have an attendance rate above 95 percent in his next term. “I think maybe you didn’t hear me the first time," Sanders said. "I ran for president of the United States. And when you run for president of the United States, you actually go around the country. You have to campaign in order to do that." The senator said he returned to Washington, D.C., for close, important votes during the 2016 campaign, but he denied the fact that he did, indeed, miss more votes than any other senator who ran for president in 2016. Related In a Third Term, Would Bernie Sanders Show Up to Work? Sen. Kirsten Gillibrand (D-N.Y.) is also considered a potential 2020 candidate for president, but she promised voters last week that she would serve out a full six-year term if reelected. Each of the seven other Vermont candidates participating in Monday's debate — Republican Lawrence Zupan and independents Folasade Adeluola, Russell Beste, Bruce Busa, Edward Gilbert Jr., Brad Peacock and John Svitavsky — pledged to serve all six years of the term and miss no more than 5 percent of votes. The event was Sanders' second of the day. He also debated Zupan earlier on Monday. Vermont’s Most Powerful Offices Are Up For Grabs This Election. So Why Is It So Slow? Sen. Bernie Sanders (I-Vt.) has formally announced that he is running for reelection this fall.